Obviously, the 8th International Converting Exhibition was much more than just slitter/ rewinders. With 401 companies from 19 countries displaying their wares across 109,000 net sq ft of exhibit space, the 6,600 visitors were treated to a boatload of other machinery, materials, components and accessories. One notable change from the previous show 16 months ago: Suppliers were not as blatant with their “green” marketing. Sustainability has simply become part and parcel of every product — whether a material made from renewable raw materials or a machine designed to use less energy. 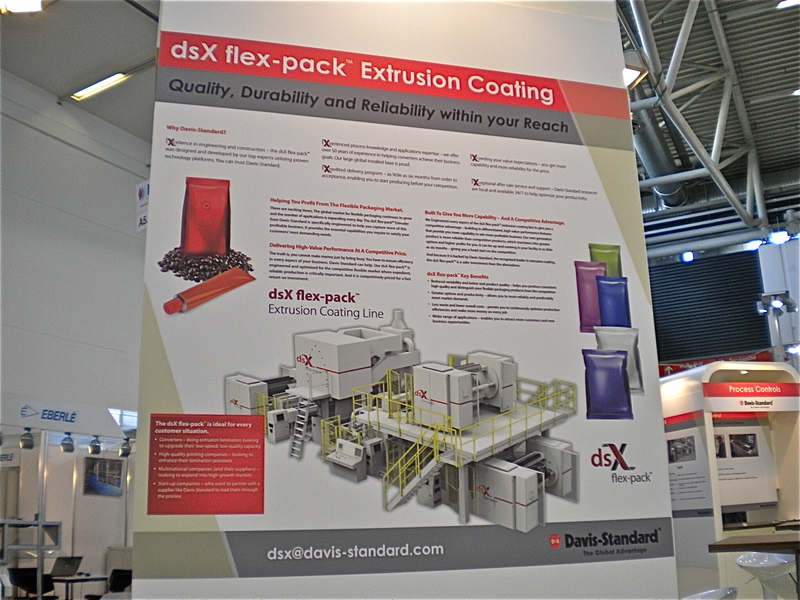 The new Davis-Standard dsX flex-pack™ extrusion coating line (Fulton, NY) provides converters and package printers with a high-value, competitively-priced system for expanding sales in the global flexible-packaging market. The pre-engineered line can be delivered quickly – in as little as six months — and converts materials for a variety of rapidly emerging applications such as salted snack and noodle bags, toothpaste tubes, sachet packs, personal-care products, condiment packs and standup pouches. 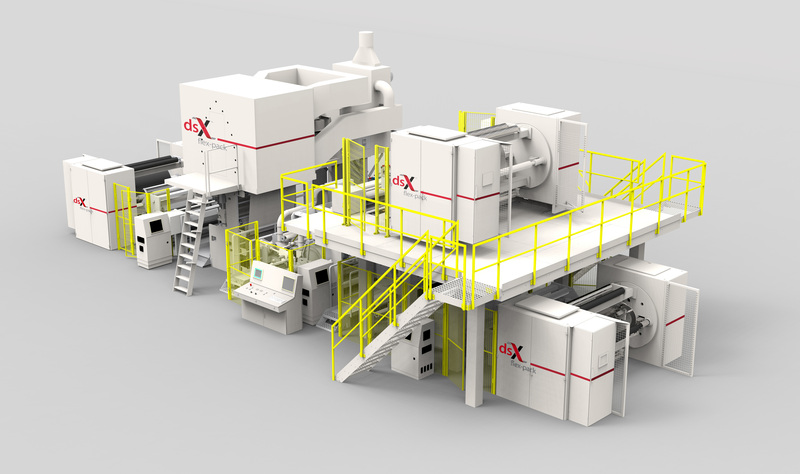 The dsX flex-pack flexible-packaging line includes unwinder; corona treaters; extrusion laminator; gravure primer/coater dryer; pull roll with nip; winder; electrically heated, air-cooled Davis-Standard extruder with advanced feedscrew design; downstream carriage and controls (Siemens drives and controls used throughout). Lines are available in two versions to accommodate almost any plant. 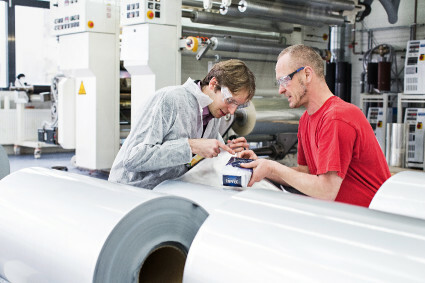 One is a longer line with the auxiliary unwinder placed close to the floor; the other raises the auxiliary unwinder to a position just atop the winder to shorten both the line length and the path of the auxiliary web to the laminator. Very low-monomer-content, solvent-free laminating adhesives (Liofol LA 7777) are suitable for high-barrier films that demand low-CO2 formation. Converters can not only reduce the risk of primary aromatic amine (PAA) formation but also the time required for decay of primary aromatic amines. In OPA/PE structures, PAAs are below the detection limit after one day. Liofol HA 2210-22 water-based, heat-seal lacquer for food applications completely excludes unwanted residual solvents. The low-temperature sealing lacquer activates at less than 100° C, can be applied on film, foil and paper and is characterized by a versatile range of applications, including banderoles, soap packs and coffee packs. Water-based acrylic PS adhesive Aquence PS 6025 is especially suited for sticking transparent labeling films to transparent substrates, such as clear glass or plastic containers. Thanks to its high water-whitening resistance, the adhesive remains ultra-clear, even when exposed to moisture, such as the condensation that can form on a beverage bottle. PS adhesive Duro-Tak 3214 is initially removable and permits repositioning before achieving its final, permanent bond strength. Its ease of use facilitates the large-area application of adhesive tapes and graphics films without loss of material, and even to surfaces that are very difficult to bond. A major application is for sticking advertising-graphics films to buses and decorative films to cars. Vetaphone A/S (Kolding, Denmark) and Coating Plasma Industrie (Peynier, France) announced their partnership at the show, in which CPI’s experience with the chemistry of plasma will unite with Vetaphone’s global presence to ensure converters get the most effective surface treatment for their products. Enhanced Atmospheric Surface Improvement (EASI) plasma tech provides many benefits for coating/converting of nano-materials, anti-fog properties, low surface aging and higher dyne levels. 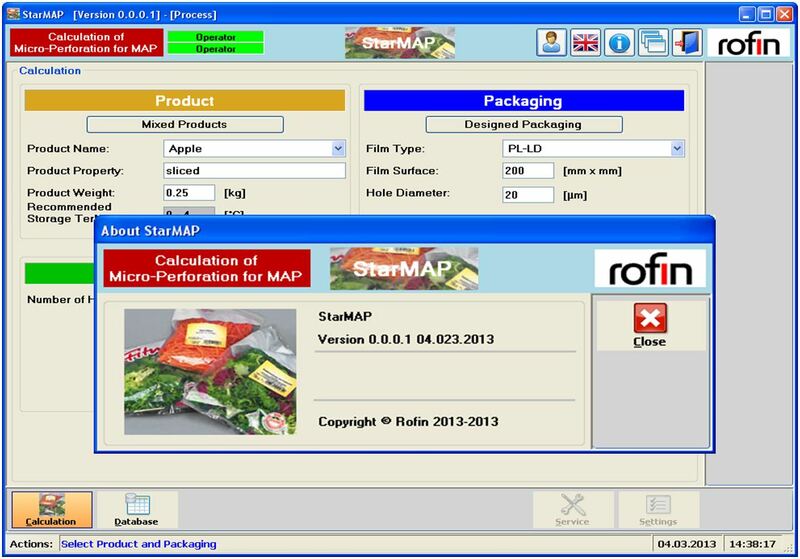 With StarMAP from ROFIN-BAASEL Lasertech (Starnberg, Germany) micro-perforations are individually customized for packaged fruits or vegetables and the package geometry (tray, cup, pouch, standup pouch, flow wrap, etc.). After looking up product-respiration and package-permeability rates in a USDA-approved database, the software calculates the optimum O2 / CO2 balance in the headspace of the packaging. StarMAP determines the size and number of micro holes, which will provide the optimum gas composition, preventing anaerobic conditions and minimizing product respiration to increase shelf-life. Meech Intl.’s (Witney, UK) CyClean™ compact, non-contact web cleaner uses double-sided blow and vacuum-based methods to flow contaminants as small as 0.50 micron into an inline filter. It consists of a cleaning head, 4x active static-control AC bars and an air-handling unit to clean webs up to 2 meters wide. The CyClean’s small footprint lets it fit into confined spaces on converting and printing lines. The Neuenhauser Maschinenbau GmbH division of Vorwald found a somewhat creepy way to promote its long list of chucks, shafts, rollers and other web-handling components. An Arnold Schwarzennegger-Terminator lookalike, dubbed “Mr. Germany” of all things, stood guard on the perimeter of their extensive stand in Hall A6. 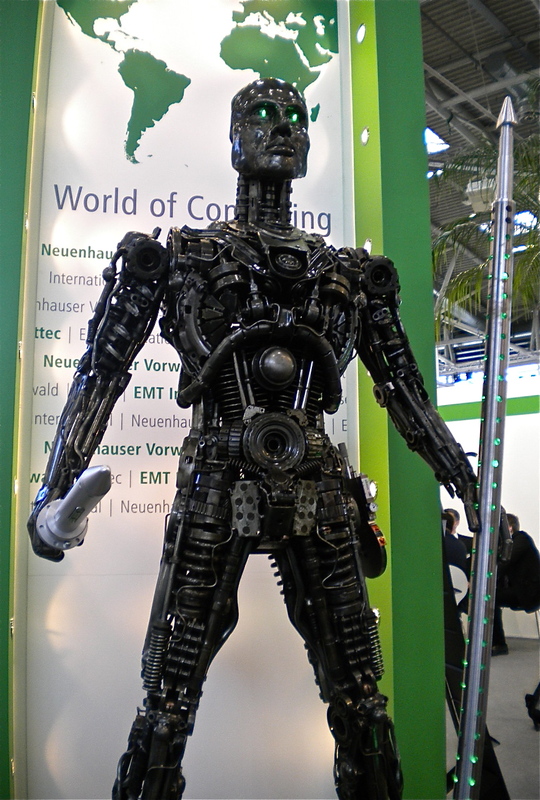 At about 2 meters tall, the skinless cyborg certainly got plenty of attention from show visitors, and while he didn’t say (with an Austrian accent) “I’ll be back…,” I know that I’ll be back in Munich for the next ICE Europe set for March 24-26, 2015, at the Trade Fair Centre. 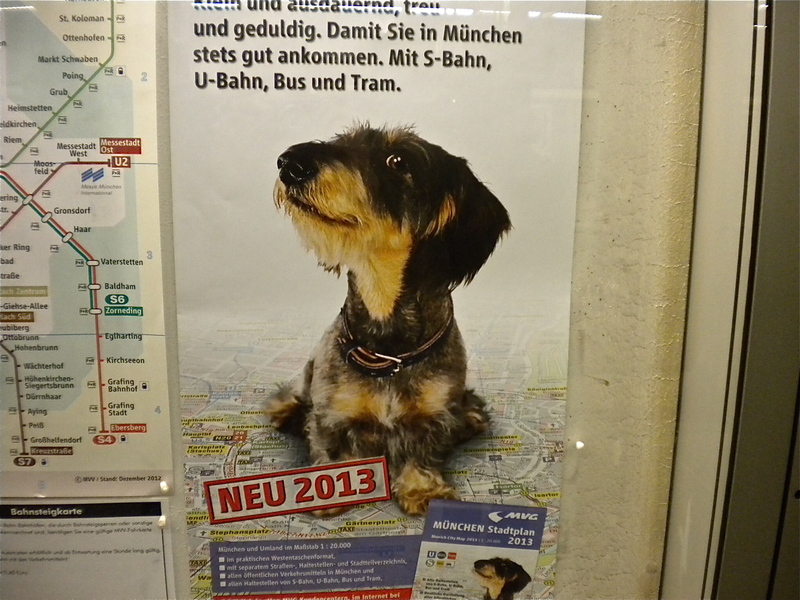 Bis dann. This entry was posted in coating/laminating, flexible packaging, labels, slitting/rewinding, sustainability and tagged business, converting, flexible packaging, gadgets, labels, manufacturing, packaging, paper, plastic film, sustainability, technology. Bookmark the permalink.